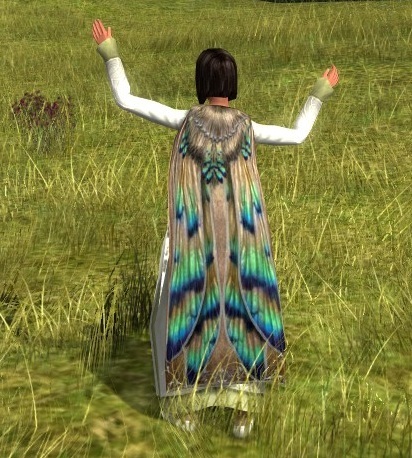 This week’s candidate is a lovely LOTRO Store offering: the Cloak of the Dragonfly. When washed or dyed white, it’s a cream that slowly darkens to light brown at the cloak’s lower hem. Dragonfly wings shaded cream, bright green, sea blue, and indigo take up much of the design. 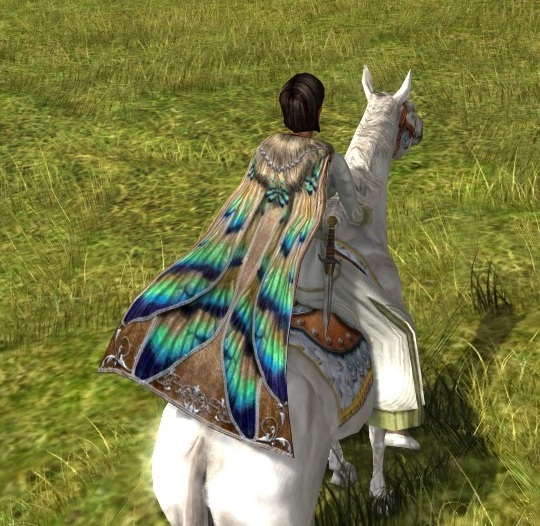 The wings do not dye; only the surrounding material changes color. It’s an intricate, detailed cloak, and I’d love to see what you folks do with it. Ohh, and you’ll see off to the right that I have started using this new-fangled Twitter business. Press “follow” if you’d like even shorter-form ramblings and links. Thanks! haven’t tried working with it since then, but I might dust it off for a new outfit in the near future 🙂 it’s really pretty and interesting! It is an interesting cloak, I have an idea for it but it requires a piece that it’s going to take me forever to get… like level an alt to 60 forever. D: The things we do for outfits…!